Planning to Develop an IoT Application? Go Through These Questions First! The world today is exploding with the Internet of Things, as the technology has been pleasantly received by the people and it has earned a name in pretty much every industry today, be it smart home systems, machinery, medicine, healthcare, security, education, and much more. Basically, on account of IoT, different devices communicate among themselves and thus form networks, which are aligned with each other and with the Internet. Statistics presented by Ericsson says the IoT-device market growth will be creating a situation where the number of connected IoT devices is going to the number of connected mobile phones in the coming times. The fields where the Internet of Things technology can be used are growing exponentially. There are various firms which are showing interest in IoT technology, and they are exceedingly occupied with the development of IoT. Today we are having smart homes, cars, appliances, watches, toothbrushes and even forks. So, what mobile applications for smartphones do is they serve as a link between the users and their devices as through them, it gets easy managing Internet of Things devices. IoT application development and mainly the development of mobile applications offer huge advantages and opportunities. Thus, you have an idea to make an application. This is an extraordinary start, however, it is not sufficient. So, before you start to look for the professionals to build up an IoT application for your business, you must first initially have a detailed view of what you want to achieve. Like what is your app's goal, its essential idea, who will be the user of your IoT application, how can they benefit from it, what hardware you can use for your application, what features to incorporate into the IoT application, possible challenges and issues that your IoT application may face? This stage will, in general, be very essential as the more details and information you can give to your IoT mobile app developers, the better results they will be able to come up with. In the meantime, it will spare time for pointless corrections and discussions. Subsequently, it is better to give special thought to this initial stage. Thus, as you become acquainted with your requirements and different challenges, it is now time that you start searching for the right IoT application development company with enough experience and expertise. How much time does it take to create an IoT App? 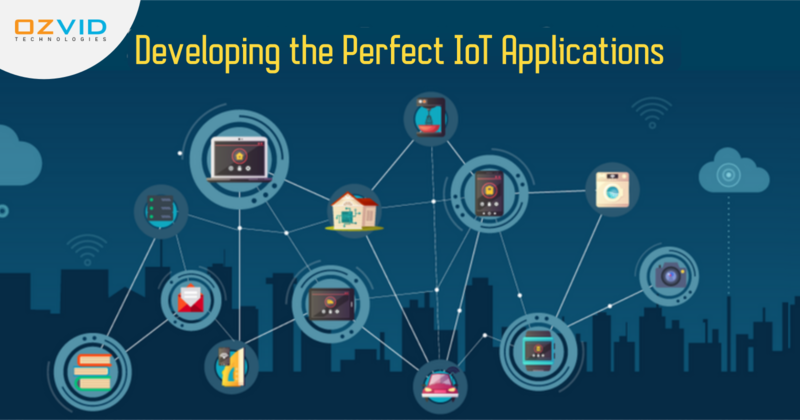 All things considered, to determine the time to develop an IoT application, it actually depends on the project's complexity level and features you are keen to integrate. Different factors are required to be viewed like project volume, the number of icons, screens, features, IoT app complexity. However, generally, the development process consumes six months to create an average IoT mobile app. Further, as you get in touch with an IoT App development firm, they will furnish you with a right estimate of the time and resources required for the development of your IoT application. As a rule, the task to create IoT software from the scratch may end up being difficult and expensive, hence IoT app developers usually use pre-built component and also preferred IoT platform with the end goal to accelerate the development and to ensure cost-efficiency for customers. What is the best mean to create an IoT App? Creating an application for the Internet of Things is certainly quite tough and it requires a lot of resources and time. Like, your entire budget must be well-planned out before you begin with the development. However, with time, as IoT becomes more prominent and various solutions are available, this technology has turned out to be increasingly reasonable every day. However, with that, the complexity of the technology is also growing as it features unlimited sensors, networking chips as well as other things which ensure the data transmission. This is the reason you should build up an application that can well respond and communicate with the other connected devices and create a single chain. Or then again to state, it is important that your products work in tandem with the other connected devices like televisions, cars, microwave, airplanes, etc. What are the factors that affect the cost of IoT app development? The kind of app you require and what is its complexity level. The amount of time needed to create an app. It directly depends on the app type and number of platforms it is being developed for. The number of team members who are involved in the app building process. Hourly rates of the designers and developers involved. This depends on the region the developers live in. Meanwhile, the rate may change as it also relies upon programming language as well as experience and expertise in IoT development. Thinking about these factors, the cost to build up an IoT application should be somewhere around $10000-250,000 depending on the application types and additional features. Can Blockchain Revolutionize the IoT Industry?